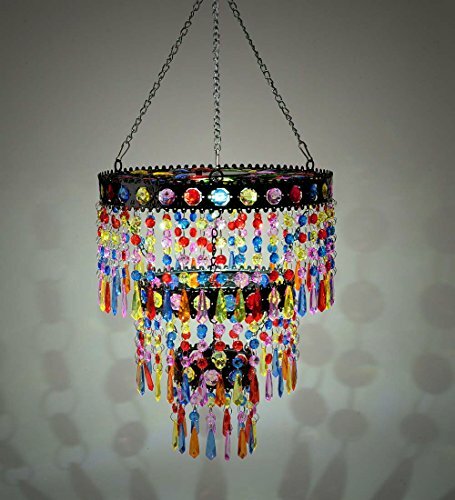 Take your outdoor spaces from drab to fab with this Colorful Solar Mini-Chandelier. The mini-chandelier is utterly captivating in the daytime as the light catches dozens of shimmering colored faux crystals suspended from metal rings. Each ring is also encrusted with a series of vibrant faux jewels. But as dazzling as this mobile-like mini-chandelier is by day, the show really gets started after dark when the solar-powered lights cast rainbows all around. With the feel of an exotic bazaar or a gypsy camp, this vividly colorful solar decoration is sure to capture attention wherever it's displayed.